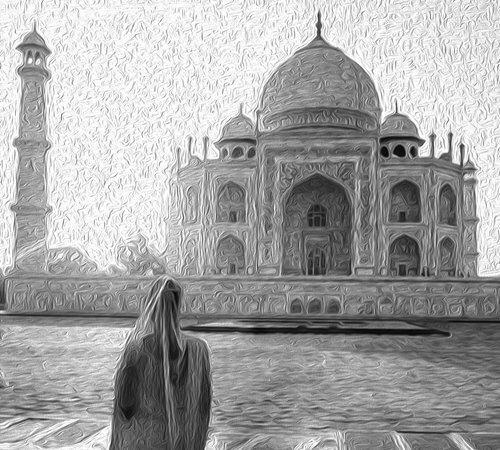 Is the Taj Mahal part of Indian culture? Like all other tourists from China, I looked forward to seeing the Taj Mahal, described by Indian poet Rabindranath Tagore as "a teardrop on the cheek of time." On the way from Delhi to Agra, I visited the Hindu temple of Akshardham. The Hindu shrine lingered in my memory as I strolled the compound of the Taj Mahal. The stark contrast brought into my mind the rift caused by religion. The hotel I stayed in was not far from the Taj Mahal. From the window of my hotel room, I could see the Islamic-style dome of the monument enveloped in a pale yellow haze, surrounded by low and decrepit houses. After a short break, we rushed to the Taj Mahal. Piles of rubbish and effluent streaking across the street could be seen on the way to the monument. The mausoleum was built by the 5th Mughal emperor Shah Jahan in the memory of his dead wife Arjumand Banu, popularly known as Mumtaz Mahal. When it was completed in 1654, the Mughal Empire was on the decline. The greatness and splendor of this building derive from the power of the Mughal Empire. The love enshrined in the monument and celebrated by ancient literati and poets in their work was actually supported by a significant amount of pearls and treasures. The colored patterns on the walls were full of inlaid gems collected from different parts of the world. The tour guide told us the marble inlay technology originated in Italy, but was made full use of during construction of the building and later gave birth to a unique handicraft art - Agra Pietra dura. To most visitors, the Taj Mahal is a manifesto of love that the emperor created with the wealth of his empire during its heyday. In essence, it highlights the ostentation and ambition of the emperor. The centuries-old building has indeed climbed to the top of world architectural art, but it was also an example of the old rule: Each empire will begin, after completing the construction of some grand buildings, to decline. Not many years after the completion of the Taj Mahal in 1654, Shah Jahan's sons fought for the throne. Eventually, his third son, Aurangzeb, defeated his brother and placed Shah Jahan under house arrest in the Agra Fort. The dethroned emperor could only see the mausoleum from the balcony of the tower where he lived. The Mughal dynasty disappeared in the dust of history, but Islam did not leave the land, and Indians view the Taj Mahal in different ways. Although the Taj Mahal combined the architectural styles of Persia, Central Asia, the Hindus and Rajputs, in its entirety the building has been constructed in keeping with Islamic architecture. All important parts of the pattern and text show that its spiritual world belongs to Islam. The difference between the Taj Mahal and Akshardham Temple is not only in time and art, but also spiritual. That is why some Hindu extremists think that the Taj Mahal should not be considered part of Indian culture. Some people even called the Taj Mahal "a stain on Indian culture" and remarked that it "should not have any place in Indian history." Indian scholar Shashi Tharoor wrote in his article "The Siege of the Taj Mahal" that "India's Hindu extremists have long considered it humiliating that a monument built by a Muslim emperor could be Hindu-majority India's most recognizable site. The difference now is that this is no longer a fringe group; its members are now in power in Uttar Pradesh, with enablers leading the government in Delhi." "The government" Tharoor refers to is the current Prime Minister Narendra Modi and his party, the BJP. In last year's election, BJP won elections in Uttar Pradesh state where the mausoleum is located. A 32-page booklet titled "Uttar Pradesh Tourism: Its High Potential," released by Rita Bahuguna Joshi, state tourism minister, mentions some Hindu and Buddhist religious places but misses one of the world's most famous monuments, the Taj Mahal. India is known as the "Museum of World Religions," but these different religions are not merely "exhibits." They cannot always peacefully stay in the same "room" for visitors to watch.